It's been months since most of us shopped at a local farmers market or enjoyed a tomato from our summer garden. But now that the warmer days of spring are here, it is time to put aside the richer - and often higher fat - cold weather dishes and return to the lighter 'green' side. Don't look back in regret however at the casseroles and gravies of winter. Each of the following recipes will have you thinking about expanding the backyard garden as you gather the ingredients needed to prepare these quick and healthy mouth-watering dishes. And your mom was right when she reminded you to eat your vegetables. 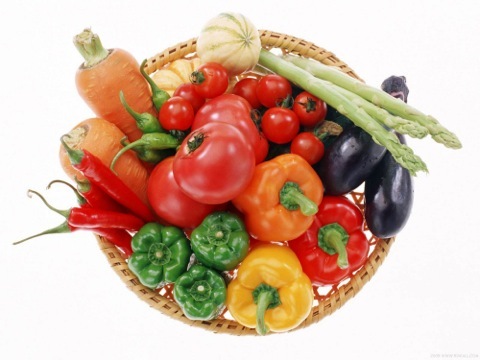 No other food group packs the nutritional punch of vegetables. So grab a bunch of carrots, some spinach and a handful of green beans and start cooking. 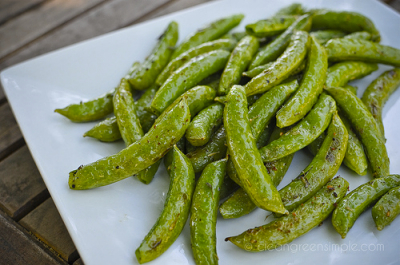 While I love sugar snap peas so much, I usually munch on them raw from the fridge, this recipe is so flavorful and quick to prepare that I often decide to make this at the very last minute. It's also a pretty flexible recipe, so substitute a favorite herb for the fresh thyme if you like. I also like to add chopped garlic, but experiment at will. This is a nearly fail safe recipe for nearly any green vegetable. Add shallots, thyme, salt and garlic. Pour olive oil over the peas. Mix the peas and the other ingredients with a spoon or with your hands. Spread sugar snap peas in a single layer on a baking sheet. Add a few twists of fresh ground black pepper over the peas. Bake 6 to 8 minutes, until tender but firm. Serve immediately. 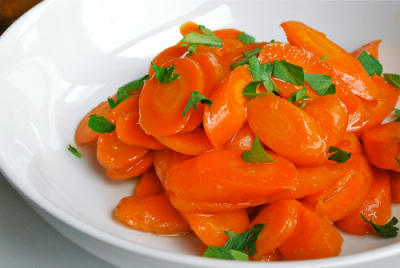 Carrots are one of the vegetables that provide more nutritional value cooked rather than raw. Carrots are also the number one veggie when it comes to supplying your body with the antioxidant carotene, which provides vitamin A. But enough about nutrition. This dish is fast, easy and low in calories even if you add the butter. And that added splash of lemon gives a nice zing to the dish. In medium saucepan, bring the water to a boil. Add the carrots, salt and sugar. Cook, covered, on medium heat for 8 to 10 minutes, or until tender. Add a little water if needed so carrots don't boil dry. If you are using butter, add it to the pan in the last minute or two of cooking, stirring so that the melting butter coats the carrots. Remove from heat. If more than 1 tablespoon of water remains, drain. I don't remember where I first learned about this recipe, but I have always been grateful that I did. 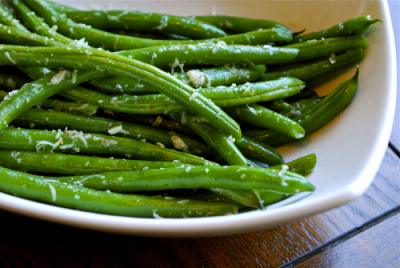 Whether served in the middle of winter or at a 4th of July barbecue, these green beans are always a hit. I often make them when I am hosting a party or dinner because they can be made the day before or earlier that morning since they should be served chilled. However don't get carried away with the Parmesan. That 1/4 cup goes a long way so don't add more even if you're tempted to. And fresh basil is a 'must'. If you don't have fresh basil on hand, make this dish some other time. It is far too delicious to spoil by not using the freshest ingredients. Cook green beans in boiling salted water 3 to 5 minutes, or until crisp tender. Plunge green beans into ice water to stop the cooking process; drain and set aside. Process Parmesan cheese and the next 6 ingredients in a food processor or blender until smooth, stopping to scrape down sides. Toss together green beans and dressing. Cover and chill until ready to serve. 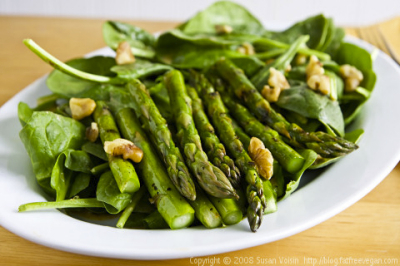 Asparagus season runs from February through June, so now is the perfect time try this tangy asparagus salad. Since the asparagus is heated in the microwave, it's a wonderful recipe to put together at the end of a long work day. Both the actual cooking and the dressing preparation take only minutes. As an added bonus, each serving is only 149 calories. Trim, peel and rinse asparagus (do not dry). Place asparagus spears flat, two or three deep, in a glass pie plate or similar microwave safe dish. Cover tightly with microwaveable plastic wrap. Microwave on high 21/2 to 5 minutes, depending on the heating power of your oven. Pour dressing over asparagus and marinate in refrigerator until cool. Drizzle with equal amounts of dressing. Recipe courtesy of USA Weekend, April 2003. Yes, I know that technically the tomato is a fruit, but in my kitchen - and I'm sure in yours - it's treated like nature's most versatile vegetable. 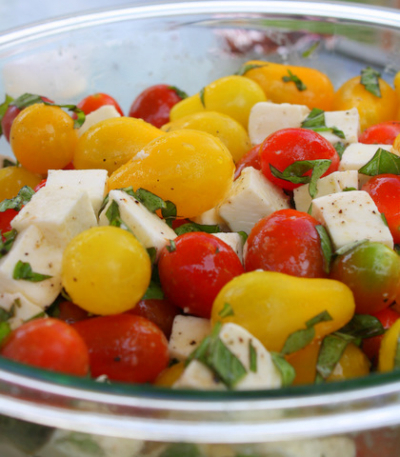 There are several variations to a Caprese Salad, but all of them use tomatoes and mozzarella. And to get the most flavor, wait until those summer garden tomatoes are ripe on the vine before putting together this dish. Pure salad bliss. Btw, if you only have one type of tomato on hand, don't worry. It will still taste delicious. And some salad aficionados prefer to slice the tomatoes and mozzarella into wheel-like slices instead of wedges. Whisk the lemon juice, salt & pepper in a medium bowl. Slowly drizzle in oil, whisking to blend. Cut tomatoes into bite-size pieces along with the mozzarrella. Garnish with the basil. Add more salt if needed. If gorgonzola is not your favorite cheese, substitute feta. However you do want a sharp pungent cheese to bring out the accompanying flavors. And candied walnuts or pine nuts can be used instead of pecans, although since I love pecans so much, I can't imagine doing that. A quick and easy salad, perfect for a summer lunch or a delectable side dish when paired with chicken or fish hot off the grill. Toss pecans with vegetable oil, sugar and salt. Spread pecans on baking sheet. Roast until a shade darker and aromatic, approx. 7 to 8 minutes. Set aside. Make dressing by combining vinegar, olive oil, shallots, kosher salt and pepper in a bowl, Whisk together, or place in sealed container and shake. 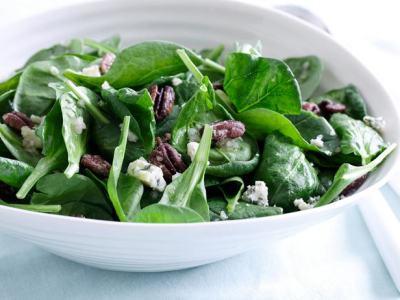 Toss spinach with dressing, crumbled Gorgonzola and pecans.